Boxwoods are a precious investment in landscape design and require a bit more care than other shrubs. I am passing along a tip I learned from my landscapers during our design process, you can read more in Front of Home “Landscape Reveal”. We have a ton of very large boxwoods on our property and they seem very hearty and can survive anything…but we recently transplanted them from the front of the yard to the back of the yard and I’m hoping they will survive the winter. As part of the new landscape design in the front yard, we added a couple small dee runk boxwoods. 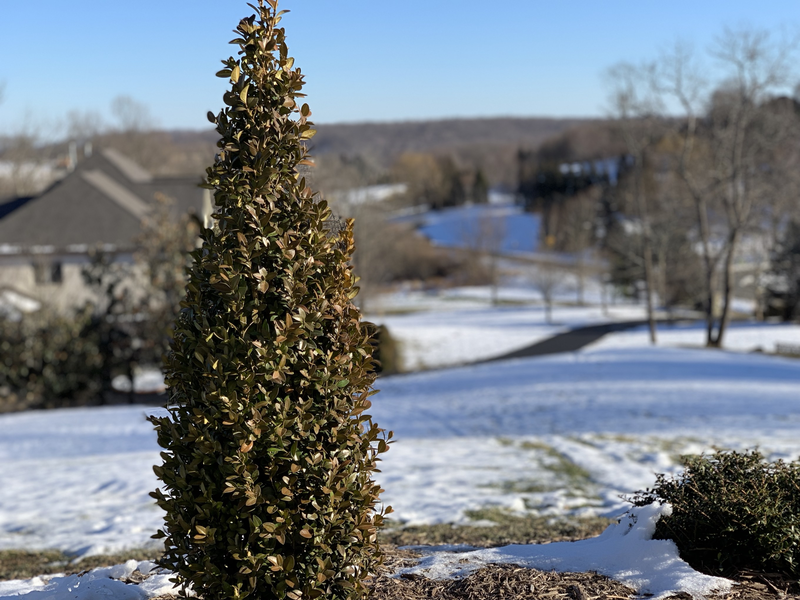 Our landscapers recommended to use a special oil treatment HERE to protect our new Boxwood plants from harm during the winter months. Spraying boxwoods in winter with horticultural oil will smother mites and other insects. It also provides some protection against winter burn. Winter burn is particularly common in boxwood, along with some other broad-leaved evergreens. Winter burn is caused when water is lost through the leaves and the roots are in frozen soil and unable to replenish the water, a process called transpiration. While most plants go through a dormancy period and don’t lose water during the winter, harsh, dry winds and road salt runoff can encourage transpiration. Mulch regularly with organic material. Boxwood are shallow rooted and moisture fluctuations affect the roots. Mulching keeps soil moisture even, and increases organic content of soil as it breaks down. When applying new mulch, be sure that it does not contact the stem. Test pH and apply a calcium product HERE to reach a pH of 6.5 to 7.2. It may take several applications to reach ideal pH. Test pH every year until the target range is achieved, then every other year to keep it in range, applying calcium as needed. Boxwood are relatively heavy feeders, so fertilize HERE around Thanksgiving. Boxwood roots are most active at this time and will make the best use of the available nutrients. Boxwoods are beautiful and a gorgeous landscape plant 🌱 , they just require a bit more work to keep them thriving and looking their best. I hope these tips help you care for your boxwoods or provide insight into your future landscape project. Subscribe to Happy Haute Home to receive gardening tips right to your inbox, and follow along on Pinterest HERE, and Twitter HERE and feel free to pin and tweet your favorite pics from Happy Haute Home.